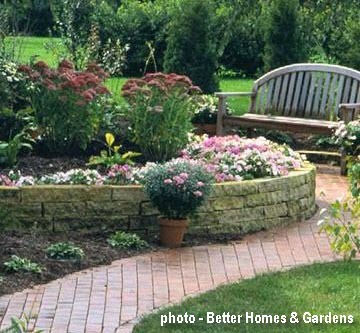 Spring is knocking on the door in the Minneapolis area, which means this is a great time to consult with a Minnesota landscape contractor to spruce up your landscape design with a unique touch such as a stone flower bed. Let’s focus now on small stone flower or garden beds. There are a number of widely varying options for this design. They can come in the form of original boxes, stone troughs, cylinders or circle pools. They may also be designed in free-form shapes. They may be constructed of natural elements or artificial stone or even concrete. The options can come in classic outlines or geometric shapes or that can be made in the form of original cups, asymmetrical and abstract contours. And these types of beds may either be flush to the ground or raised; some are constructed in multi-level arrangements. Typically, stone flower beds — be they large or small — are designed to create a bright, eye-gaze accent, thus varying the appearance of the garden and providing a sense of visual completeness. A flower bed constructed of stone is quite commonly seen in classic gardens as well as urban parks and gardens. They are often seen in the eclectic gardens and projects in the art nouveau era. They can also be seen in high-tech environments. Stone flower beds provide an excellent opportunity to create a fascinating setting for small objects that would please the eye with luxurious details as well as fully reveal the style of your overall landscape plan. For stone beds, the contents can vary immensely. They are a versatile way to combine shrubs, fountains, sculpture, trellises, and even small trees. They’re a great design option when a traditional garden bed just won’t work, or when you’d like to show off a special feature of your yard, say your prize-winning roses or an antique gazing ball. For more ideas on how to beautify your Minnesota garden, check our the Unique Garden Plantings photo gallery. You may also find some inspiration on our Pinterest boards. If you see something you like, give us a call and we’ll discuss how we can make it work for your yard. Architectural Landscape Design is a licensed landscape contractor serving the Minneapolis/St. Paul MN metro area and outlying communities. We provide a wide range of landscaping services including excavation and grading, landscape lighting, and outdoor kitchen design and installation.